Contrary to the opinion of some commentators, who claimed that this painting was "never seen in public before", this miniature is well-known. It has been a long-time on loan exhibit at the Augsburg Mozarthaus and has been published many times, the last time in 1999 on p. 27 of Johannes Jansen's book Mozart (Köln: Taschen). PROBABLY THE MOST IMPORTANT LIKENESS OF THE COMPOSER EVER TO BE OFFERED AT AUCTION. ONE OF ONLY A DOZEN OR SO AUTHENTIC PAINTINGS AND DRAWINGS OF THE COMPOSER. ONE OF ONLY TWO AUTHENTIC PAINTINGS OF THE COMPOSER ENNUMERATED BY THE MOZART ICONOGRAPHER OTTO ERICH DEUTSCH REMAINING IN PRIVATE HANDS. The appearance at auction of this portrait by an anonymous artist of the twenty-one-year-old Mozart, a present to his first serious dalliance, his eighteen-year-old cousin (the Bäsle) Maria Anna Thekla Mozart, represents an opportunity to acquire a Mozart object of stunning and virtually unparalleled significance. The portrait is of touching simplicity and freshness. Wearing a red coat similar to that in the famous della Croce family portrait of 1780, his fine blond hair powdered and tied fashionably with a large black bow (one recalls a later letter from Vienna, that of 22 December 1781, relating how the fastidious composer's day would begin with a visit at six o'clock in the morning from his hairdresser), Mozart gazes directly at the viewer with intelligent, large blue eyes, a playful and open expression on his features. No other portrait of the composer perhaps conveys as this does what might be called Mozart's most defining characteristic, above and beyond his feeling for form and beauty: his genius for humour. Some of these statements are so absurdly exaggerated that they barely deserve a comment. Especially telling (and funny) are the phrases "one of only a dozen or so[sic] authentic paintings", "a Mozart object of stunning and virtually[sic] unparalleled significance", "the portrait is of touching simplicity and freshness" and especially, "no other portrait of the composer perhaps conveys as this does what might be called Mozart's most defining characteristic". The last statement which claims that "the portrait has never been reproduced in color in the standard Mozart literature", is a lie that is supposed to mislead the customers. The portrait has been reproduced in color in 1999 in the aforementioned book by Jansen which is certainly part of the standard Mozart literature. The continuing presentation of new supposed "Mozart portraits" on a strange flea market of vanities has lead to a situation where the experts of one of the world's leading auction houses do not know the exact number of authentic Mozart portraits. 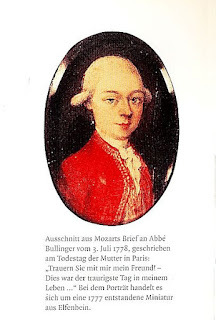 It does not strengthen the credibility of these experts that they present a list of twelve portraits – which they call "the canon according to Deutsch" – but fail to mention that in his 1956 article "Mozart Portraits" (in The Mozart Companion, H. C. Robbins Landon & Donald Mitchell eds., London: Faber and Faber) Deutsch counted the 1777 miniature among the "spurious anonymous portraits". Deutsch described it as "formerly in the possession of Mozart's cousin, 'Bäsle', Mannheim, November 1777" and yet he considered it spurious. To anybody with a training in history of art the reasons for Deutsch's judgement are perfectly obvious. The 1777 Mozart miniature – even if it is genuine – is not of "virtually unparalleled importance". Neither is it "the most important likeness of the composer ever to be offered at auction". The miniature is of almost no iconological value at all. It is a classic eighteenth-century "porcelain doll head miniature", a stylized type of portrait of which huge numbers were produced in Mozart's time. Similarity with the sitter was not the purpose of these pictures. Some authors who described the 1777 miniature realized and acknowledged this simple fact. In his biography of Mozart Robert W. Gutman writes: "It stands within the bounds of possibility that the portrait of Mozart he himself commissioned for her survives as the miniature in Augsburg's Mozarthaus. Yet, the physiognomy troubles: if it is Mozart's, the artist has much refined the cast of the features; but Mozart may have insisted on an idealized image." Of course the people at Sotheby's have to boost the sale price and thus cannot afford to assume the more restrained perspective of impartial art historians. How they describe the lack of technical quality in a poorly executed mass product as "the portrait is of touching simplicity and freshness", is very amusing. The "genius for humour as Mozart's most defining characteristic" that these experts claim to see, simply results from the slight smile which was supposed to always appear on these standardized portraits. Here is another "never before seen Mozart portrait of virtually unparalleled importance. Mozart gazes directly at the viewer with intelligent, large blue eyes, a playful and open expression on his features. No other portrait of the composer perhaps conveys as this does what might be called Mozart's most defining characteristic, above and beyond his feeling for form and beauty." Of course this is not a Mozart portrait. It is a portrait of Joseph II in the popular tradition of Joseph Ducreux which recently was on sale at an auction at the Salzburg Dorotheum. I am using it here, because it is the same type of a stylized mass product as the doll-like face on the Mozart miniature. Sotheby's overblown marketing campaign for the sale of this miniature is an embarrassment for the company. The owner of the painting deserves to get a reasonable sale price. But the methods that were applied in this case do not belong into the more glorious chapters of art-dealing. Update (20 November 2014): The miniature did not reach the lowest estimate price and was sold for 180,000 GPB (218,500 GBP with buyer's premium). LOL! I LOVE your post! You wrote: "Deutsch described it as "formerly in the possession of Mozart's cousin, 'Bäsle', Mannheim, November 1777" and yet he considered it spurious." So, the portrait really belonged to the Bäsle, but it being Mozart is more than dubious? Mr Gutman mentioned "the portrait of Mozart he himself commissioned for her". Do you know the source of this informatrion? I can find no other reference to Mozart having done so, in the correspondence or elsewhere. This is a mere assumption, based on Mozart's letters to his cousin from November 5th and 13th, 1777.